Using proven methods and strong networks, together we will customize a specific plan for your home both locally and regionally. A strong marketing program is essential to selling any property; which is why at Signature, we make sure we take care of that for you. Our research shows that the majority of our buyers are within a 50 mile radius. As soon as your home goes public on MLS, we send out “Just Listed” postcards. Our professional engineers can create a digital floor plan of your home that will help the buyer feel like they are in your home just by looking at the virtual tour. By using online exposure, the open house date and time will reach the largest possible pool of active buyers. Having an open house for brokers only, allows us to introduce your property to the local broker community. A very traditional, but extremely effective way to promote your listing to the local community. Research has shown 10% of buyers found their home through a yard sign. The following regional marketing plan will build upon our local efforts. Using the mediums below, your property will be made available to a great number of affluent buyers within the New York Metropolitan and surrounding areas. An upscale publication produced 13 times a year, Homes & Estates has a very focused North Shore distribution. 35,000 copies are distributed from Great Neck to Setauket at 90 different locations along Route 25A. Long Island’s popular newspaper with a total daily circulation of 377,517 and a Sunday circulation of 433,894 throughout the 5 Boroughs, Nassau and Suffolk. A Long Island magazine with great exposure for listings. 27,000 magazines are distributed every 4 weeks. 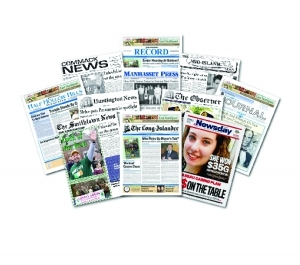 The official newspaper for the Town of Huntington; produced weekly, serving the communities of Huntington, Huntington Station, Huntington Bay, Lloyd Harbor, Cold Spring Harbor, Halesite, Greenlawn and Centerport.